The F-TYPE. It's not only a sportscar - it's a Jaguar sportscar: the difference is important. Don't expect a racetrack refugee - but don't expect a luxury GT either, the kind of car sporting fans of the brand have had to be satisfied with for decades. Think instead of what an Austin Healey or a Triumph TR6 might be like re-interpreted for the modern era, a roadster designed very much for the road. A machine you can't help but want to drive. And drive hard. Here, we're going to focus on the Convertible version in its earliest 2013-2017 guise. The Jaguar F-TYPE was a car over half a century in the making. At its launch in 2013, it'd been that long since we'd seen a proper Jaguar sportscar, a successor to the iconic C, D and E-Type models that defined this market in the Fifties and Sixties. In that post-war period, the Coventry company was a brand known for true drivers' cars, rather than the luxurious GT models more familiar from the modern era. Think of peoples' perception of Porsche today: back then, you bought a Jag for that kind of thing. Might you do so again today? Well the F-TYPE aims to persuade those in any doubt, pitched and priced into a small market niche that lies precisely between Porsche's Boxster and 911 models. It was launched originally only in Convertible form with a choice of 3.0-litre , though a fixed-top Coupe version was added to the range in 2014. For the 2015 model year, Jaguar introduced the option of manual transmission and AWD. A top V8 SVR model was introduced in 2016. In 2017, a four cylinder 2.0-litre engine was introduced into the range following a mild facelift, but it's the earlier re-facelift models that we're going to focus on here. It's said that every piece of design should tell a story. That was certainly true of Jaguar's last proper sports roadster, the E-Type, once described by Enzo Ferrari as the world's most beautiful car. So what would the great man have made of its successor? The shape is certainly interesting, a complex tale of the past mixed with hope for the future. A shape that clearly underlines Jaguar's determination to go its own way and offer something different. And one defined by what are described as 'heartlines' forming the front and rear wings. Get beyond the muscular clamshell bonnet with its signature power bulge then turn your attention to the bold, angular Jaguar front grille and you'll pick up the first of these heartlines in the blade dissecting the shark-like gills that dominate both front corners of the car. It's a crease that runs along the top of the wing, defining its shape, then flowing on into the door before gracefully disappearing rearwards. Here you pick up a second heartline which swells out to form the muscular rear haunch before sweeping dramatically around a sharply proportioned tail section emphasised by wraparound LED lamps and an active rear spoiler that raises at 60mph, then lowers to fit flush when the speed drops below 40mph. Look down at the back and you can identify the engine on offer, with twin centre tailpipes in the V6 as opposed to the signature quad outboard-mounted tailpipes that would be fitted to the faster V8. The convertible roof, as you've probably already gathered from this car's clean, compact shape, isn't the kind of heavy metal folding deal you'll find in rival Mercedes sportscars: that would have upset the low centre of gravity and near 50:50 weight distribution the engineers prioritised so much with the light weight aluminium architecture of this design. So it's a multi-layered fabric affair with a thick Thinsulate lining that raises or lowers in just 12s and doesn't need a panel or a tonneau cover to smooth it over when stowed. Instead, the top section of the roof itself keeps everything looking tidy. Unlike a metal top of course, it doesn't rob you of bootspace when it's down. Which is just as well, because there isn't much. The 196-litre boot is one of the relatively few things that might make you think twice about this car, though those who've criticised it seem to have forgotten that we're talking here of a storage space nearly 45% bigger than that of a rival Porsche 911 Cabriolet. To be fair to the 911, that car does also provide extra room with a couple of small rearward seats. Which you don't get here, this being very much a two-seater design. Grasp one of the lovely pop-out door handles (there to provide what Jaguar calls 'a mechanical handshake') and you can experience it from within. The door sills aren't excessively wide or deep, so you can climb in quite gracefully and lower yourself into a focused, enveloping cockpit that sits you 20mm lower than you would be in an XK and curves itself around your body. It's certainly very firmly driver-orientated, the two front occupants separated by a prominent grab handle which sweeps down from the top of the centre console and wraps around behind a proper joystick-shaped SportShift gear selector: in contrast to other Jaguar models, there's no rotary gearshift controller here. Good. It's all symptomatic of the design team's determination to create something very different. An intimate place where luxury is not allowed to supersede purpose. It's not perfect of course. The paddle shift selectors are plastic when they should be metallically fashioned and there's one of those fiddly electronic handbrake switches. We don't think the typical sportscar legs-straight-out driving position will suit everyone either, but the copper-coloured starter button is nice. So is the way the washer jets are mounted on the wipers to clear a murky screen so much more effectively. We also like the small diameter, three-spoke leather-trimmed wheel which frames a brace of analogue instruments separated by a TFT information screen. Anything you want to know that it can't tell you will probably be covered by the infotainment touchscreen in the centre of the dash - unless it's to do with ventilation, the functions for which are separated out into the three chunky heater dials that sit beneath it. Talking of climate control, at first glance, there don't seem to be many cabin air vents. That's because two of them are hidden away on top of the centre console, rising automatically to clear the screen and cool the cabin only when needed. Lovely. Prices start from around £30,000 for a 2013-era 3.0-litre 340PS Convertible F-TYPE model, rising to around £46,500 for a later '17-era car. If you want the 380PS 'S' version, prices start at around £35,000 for a '14-era car, rising to around £57,000 for a later '17-era model. For a 5.0-litre V8, prices start for an 'S' variant at around £46,500 for an early '13-era car, rising to around £62,000 for a later '17-era model. For the more potent AWD 'R' version, prices start at around £60,000 for an early '14-era car, rising to around £80,000 for a later '17-era model. We came across lots of happy F-TYPE buyers in our ownership survey but inevitably, there were also a few who'd experienced problems. One buyer had to get a roof replacement because the fabric wasn't properly secured to the frame. For another customer, the roof was stuck in an almost closed position, with at the same time, the dash displaying a warning saying the roof couldn't be operated at over 30mph. There have also been reports of the convertible top getting stuck mid-stream and part of the roof mechanism not laying flat when the top is down. A few buyers experienced issues with the dash-top vents not coming up when they should - or rising only halfway. In one case, an owner found that the passenger side door wouldn't open. Look out for rear suspension thump on your test drive. It's caused by an absence of an isolator sleeve fitted to the rear coil spring. Some cars may have issues with flaky paint. With others, there may be water in the headlamp covers. One owner found his brake lights sticking on. Others had issues with the stop/start system and the tyre pressure sensors. Look out for dashboard creaks and squeaks and water penetration on the passenger side. A few gearbox faults have been reported too. (approx based on a 2015 F-TYPE 3.0 340PS) Front brake pads can cost as little as around £37 but are typically around £64-72 for a pair. Brake discs cost from around £165 but for a pricier brand, you're looking at need to pay up to around £260. An air filter is around £70, while an oil filter is around £40. A headlight bulb is around £122, while a wiper blade costs in the £8 to £10 bracket. A rear suspension link will cost around £36 but could cost up to £82. A true sportscar - a real sportscar - should pump the blood around a little faster long before the pedal hits the metal. This one does. It looks poised and ready, even when it's standing still. 'Drive me', it seems to say as you approach and the door handle springs out to greet you. 'Start me' it seems to shout once you're enveloped in the figure-hugging sports seats and angled towards the little copper-coloured starter button. 'Rev me', it seems to insist as you fire the engine and a spectacular set of aural fireworks begin. You're going to want to lower the fabric roof to better hear them of course - a process that can be accomplished in just 12s at speeds of up to 30mph - but once you do, you won't be disappointed. Personally, we usually like our automotive sound effects to come from the engine rather than, as here, the tailpipes at the back but even we have to admit that this car hums an addictive tune. For driver involvement, it really had to be that way for the petrol powerplants on offer aren't of the Porsche high-revving kind and weren't originally developed for sportscar use. The supercharging employed in every case means that the very considerable pulling power would normally be developed quietly but effectively very low in the rev range: just what you want in an XF or XJ luxury saloon. And very impressive in an F-TYPE too, provided it can here be accompanied by a howling crescendo as you power through the gears and the horizon spools towards you on fast forward. Which is precisely what you get, provided you've got a car with Jaguar's clever Active Exhaust system fitted and activated. At the wheel of an F-TYPE equipped in this way, we can't think of any more effective way of annoying your neighbours. At least you won't be hanging around long enough for them to serve you with an ASBO notice: even in the entry-level 340PS V6 model thanks to 450NM of torque, sixty from rest is just 5.1s away en route to 161mph. That's if you're careful with your throttle foot. Further up the range where a Dynamic Launch Mode is standard, you won't have to be, the electronics firing you up the road in addictive fashion. And doing so very quickly indeed. With a tweak to the software of the 3.0-litre unit, 380PS is possible, creating an engine that in the mid-range V6S model powers to sixty in just 4.8s on the way to 171mph. Fast enough for anyone, you would have thought, though not for the folk who'll settle for nothing but the 495PS V8 version, offering a thumping 625Nm of torque and good for sixty in 4.2s on the way to 186mph. Overtaking in this variant will be instant, 50-75mph taking just 2.5s. But making this car fast was a very small part of making it great. After all, a Jaguar XK from this era can be fast, but unless you really are an ardent fan of the Coventry brand, you wouldn't consider one in the same breath as a Porsche 911. 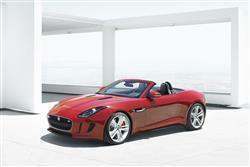 Can the F-TYPE do better? Before driving one, we had our doubts. After all, despite Jaguar's boasts of 'lightweight aluminium engineering', it's heavier than anything this rival German brand can offer and has none of the advantages of mid or rear-engined placement. Jaguar hasn't got around to developing a twin clutch automatic transmission system either. Early models featured old-tech hydraulic steering too, though that was replaced by an electrically-powered set-up in 2015, at the same time as the brand added in the option of manual transmission and 4WD on selected variants. A 575PS top V8 SVR flagship model was added to the range in 2016. Put off by this model's relatively old-school engineering approach? The steering set-up provided turns out to be direct and feelsome, the quickest rack ever provided by the brand making this car way better than any previous Coventry model in communicating what's going on beneath you. And the paddleshift ZF auto gearbox is a rapid fire Quickshift system with eight closely stacked sporting ratios, optimised to constantly keep the supercharged engines in the sweet spot of the power band. Activate the Dynamic mode and it gets even better, both steering and shifting taking on an even more aggressive demeanour, with a weightier feel at the helm and super-fast changes that also adapt themselves to road conditions, cornering and your driving style. At the same time, throttle response is sharper and there's a slight loosening of the stability system safety net. If you're in an S model, the damping will sharpen up too thanks to an Adaptive Dynamics system that controls body movement, roll and pitch. It's well worth having and you can tweak any of the individual 'Dynamic' system elements with configurable menus hidden away in the touchscreen infotainment system, enabling you to specifically set up your F-TYPE to your own personal preferences, much as a race team would set up a racecar. You can also get G-force readings and laptimes. So, ultimately, what does it all mean? Did Jaguar really build a world beater here? Ultimately, it depends what you want. It isn't the best track car in its class - which is fine because it doesn't set out to be. The few potential buyers who'll regularly be pounding around on circuit days will be better off in a Lotus or a Porsche. Choose an Exige or a 911 if you want a car in this class that'll really make you feel like Fernando Alonso. This car is engineered primarily for roadway thrills, though having said that, we'd suggest that the V8 version is almost too fast for the public highway: most who can afford one are probably going to frighten themselves with it. Which is why personally, we think the V6 route is a better way to go. The mags will all tell you to spring the extra for the 380PS 'V6S' variant which like the V8, has a limited slip differential to help get the power down (though in this case a mechanical rather than electric one), plus you get the adaptive damping, a set of bigger and even more effective brakes and of course the extra power. Is it all enough to justify this variant's fat price premium? We're not so sure. The entry-level 340PS V6 is quite quick enough thankyou very much, offers F-TYPE motoring in its purest form and makes you work a little harder in the extraction of all its performance - something we rather like. In fact, we've also enjoyed this car when we weren't driving it hard thanks to a suspension set-up that eases you over bumpy or broken surfaces giving the car a beautiful point-to-point flow, whether in town or on the highway. No one does this kind of thing better than the engineers at Jaguar. Jaguar could have made it easy on themselves. They could have effectively parked their E-TYPE legacy and given up on ever replacing it. That's what the company has essentially did for four decades - but then at no time in that period was Jaguar the company it is now, one with new-found dynamism and swagger. A business ready to remind everyone of its founding membership in the sportscar segment and a rich sporting bloodline stretching back over 75 years. This is a machine that steers, handles, stops, goes - and sounds - exactly as a Jaguar should. That sound element is important - and it's one of the key reasons why you might want this Convertible model rather than the alternative fixed-top Coupe. Either way, don't knock the F-TYPE because it's not a Boxster or a 911: the F-TYPE was never intended to be like anything else. This model is different, powerful, sensual, ultra-precise - a car that feels alive. We don't think it'll suit many who associate performance motoring from this brand with XJS or XK models. Buckle such people up behind the wheel and they're liable to be a little taken aback. No matter. Jaguar needed to find a younger, more demanding, hungrier audience for its sportscars. It needed to convince people that here and now in this market at this time in history, it could be great again. Mission accomplished.